I found out yesterday (some of you may already know this...) that Kelloggs is phasing out the codes found in their packaging. Instead, you will be able to add your store loyalty card to get points when you shop and submit store receipts to collect points. Not sure I love this yet but I am sure I will get used to it. It definitely will be easier in one way...I won't be digging through the garbage looking for the cereal box someone threw away so I can get my code out of it. :) Hubby was good at that. :) You can still enter box codes on their site but make sure you add your store cards! 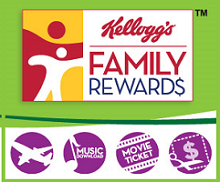 So, as part of this new change, you can get up to 300 FREE Kellogg’s Family Rewards Points! Add one of your store’s loyalty cards to get 100 points. You can also connect your account with Twitter and complete your profile to get up to 200 more points! Check it out today!